In a typical silly, meaningless moment, one of the pundits helped average Americans relate to this 700 billion dollar bailout by letting us know that it is enough money to buy 2000 McDonald's Apple Pie desserts per American. And, while it is a childish and silly comparison to make, let's think about it for a minute. Would I, as an American, rather give Wall Street and large businesses who should have known better 700 billion dollars, or would I rather have 2000 apple pies? You know, I'll take the apple pies, please. Back when the 100% financing on homes first started in the US (yes, you could actually borrow 80% from one lender and the remaining 20% from another), I questioned the sanity of it. After all, does it really make sense to give someone a $150,000, $300,000, or $700,000 asset with no skin in the game? If none of my money is in my house, then suddenly if I walk away my credit is the only thing going. I haven't lost any money and I can rebuild my credit, right? Then I started to hear about these wonder products, the Adjustable Rate Mortgages (ARMs). Ooh, now that's a great idea. I'll take out a mortgage for more house than I can actually afford. But, because of this magic adjustable rate mortgage my house payment now will be smaller. And, interest has been low for so long, surely it'll stay that way, right? Can we say, unable to afford our house payment in the blink of an eye? When El 3atal and I bought our first house, we saved money and found a way to come up with the minimum down payment to get into the house. Our house payment was well below the "formula" (we were approved for a house up to say $225,000, but chose to buy a house for $150,000). We found a house payment that we were comfortable making. When we outgrew the house because we were expecting ButterBean and both working from home, we again bought a house far below what the bank said we could afford. And this was before the days of 100% financing and ARMs. And, was I ever glad we did. I got laid off and when I found a new job after about 6 months of unemployment (which is like 6 pennies, honestly), it was at a significant paycut (better than 10%). Thank you, George Bush. Then it happened again 2 years later. New job, new paycut (twice in 3 years, Thank you SO MUCH George Bush). But still, we were living within our means and saving for our children's education and our own retirement future. During these same days, we saw reports of all these people buying houses they knew they couldn't afford on a fixed rate mortgage. So, they took a risk, a big risk, on these ARMs. They bought more house than they could manage. Let's be frank, they got a bit greedy wanting the benefit without doing the work for it - the hard scrimping and saving that Americans have always done to afford that first house (or second, or third). And now, I should bail out the companies who were handing out money like it was candy. I should bail out the companies who bought these bad mortgages because they wanted to make money on them. And they did... they did make money on them. Beyond that, I should bail out these companies so that they can go on operating exactly as they did before. Same guys in charge who apparently, despite all of their fancy degrees and experience can't see what I could... That's right, I, a girl from the small-city South who never claimed to be good in math could tell that the mortgages were a bad idea and trouble waiting to come find them. But they couldn't?! First, all companies that are taking advantage of the bail-out will have all new management. Anyone in the management structure at the VP level or above will leave with no further compensation than they have already received (no bonuses, no packages, nothing). The cost of the bail-out (including administrative costs) will be taken out of the profits for the company under its continued operations. It will have a loan, just like the affected homeowners. Second, new mortgages would be issued to forestall further bankruptcy and mortgage defaults. These mortgages would extend the payback time and require that all of the original loan be repaid with an additional fee for the costs of the bail-out. If the borrower goes into bankruptcy, they are barred from receiving any sort of loan or mortgage secured in any way by government backing. Period. Ever. Finally, the rules surrounding the financial markets will be reviewed. New rules will be put into place to ensure that this type of debacle does not occur again. A watchdog committee will be formed again with a representation from various industries (and at least one person with enough common sense to see that the loan practices of the past were just plain dumb). Wow! For those of you who haven't seen today's Jordan Times, this gal said it all. Let me just say that this woman is brave. Regardless of her religious affiliation (and I have no idea what it is), she publicly stated a very unpopular view. Personally, I find her letter well stated and directly on point. As one of the far minority Christians, the issue she raises is one my biggest problems with Ramadan. Not that most places close, but that they are forced to either close or stop selling food. It makes Ramadan an unpleasant time to try and work. We don't have a full kitchen, so our choice is basically to go home for lunch (using lots of gas and lots of time). And, I don't mind at all that my favorite hummus place closes every Ramadan. Or that the closest restaurant to the office takes every Ramadan off. Even if they could serve food during the day, they wouldn't. But, I do mind that the coffee shop (owned and staffed by Christians from what I can tell) nearby can't serve shakes and sandwiches. That's what causes me to have no options. Very challenging. So, I'm going to second this brave person's thoughts. Maybe next year those who make such decisions will "consider the needs of all Jordanian citizens (as well as foreigners and visitors). Remember that a lot of people are not fasting and while being sensitive to those that are, they choose to eat and drink as normal." Maybe next year places can serve food or not as they choose rather than by regulation. Oh and, maybe those who fast will "behave in a holy and dignified manner during Ramadan" as she suggests rather than exhibiting "bad-tempered and erratic behavior." Thanks, Ms. Tash for putting my feelings into words so very eloquently. So, I saw an article as a delicious pick on Nas' blog and the title made me think of Tim's post inaccurately portraying rednecks as people who would leave our busted cars on the streets near our homes. I called him to task for it (we have more class than that, we put them on blocks on our own yard next to our indoor furniture that's left outdoors in all weather). But, the reality is that this one caught my eye becaus the title is patently wrong. Well, maybe not. There may have been a redneck that got elected to the presidency, twice, in the past. But George W. Bush ain't it. Kinzi and I had a conversation a bit ago (spurred by Tim's post) about the term redneck. She said her cowboy cousin told her of the origin of the word and while pieces may be factually accurate or not, the bottom line is it's correct. Rednecks refers to farmers and workers of the dirt, originally mostly in the South, who wear baseball caps to keep the sun out of their eyes. Because baseball caps offer no protection for the neck, you end up with a guy who has a big old patch of red on the back of his neck. Voila! There's even a comedian who started his career out of talking bad about us (and he is one, so he can). His name is Jeff Foxworthy and he's a genious. Now, this man knows what's it' like to be a redneck. He is clearly from a long line of rednecks. I can say that with certainty because I also come from a long line of red necks. My dad went to school in a one room schoolhouse in the thriving metropolis of Loachapoka Alabama. It's on the road from nowhere to nowhere. My early memories of his family are things like hunting and fishing and watching my great aunt make stuffed animals from old socks. I assure, I know something about being a redneck. For another perspective, a friend (who is also from a long line of rednecks) sent me this link -> http://www.gwinnettdailypost.com/ftp/multimedia/waffleweddingx/publish_to_web/ . Yes, anyone who weds their love at a Waffle House is absolutely a redneck. So, I say again that while W may speak with a Southern accent (and sound less than brilliant to boot), he is no redneck. In fact, if you listened to Jeff Foxworthy you would have heard all of the criteria which he certainly doesn't fit. So, this Ramadan has not been a good time for the Bean family's cars. As you all know, I got hit earlier. Well, as I suspected a little "bolish" was not enough to remedy this situation. The guy bent the bumper cracking the paint (and who knows what else underneath). After El 3atal called him, he plead how poor he is (just a poor employee of our fine gas company) and his wife in the hospital and he's fasting and you don't know what that's like (because Christians never fast of course). There's no way he can afford the 100JDs that it will cost to paint the car, can't we do it somewhere cheaper? So, El 3atal says, well simply pay our 25JD deductible and we'll file it on our insurance. A nice gesture, no? And, what happens, the man begins to shout. 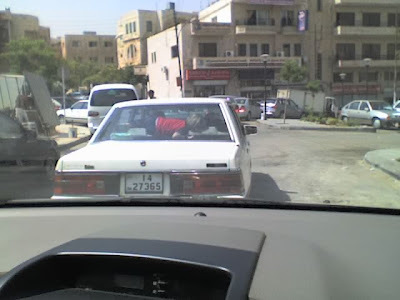 He rails at El 3atal, indicates that the fact that I stopped in heavy, predictably stop-and-go, traffic MADE him hit me. Then, he threatens to bring his whole family and kill El 3atal. My friends who are Muslim, you should bring this man to task. People like this give Islam a VERY bad name. But, all his Ramadan fasting will come to naught with this type of behavior, so I guess he will get his own reward, no? But honestly, that's the outcome, the end point of this journey. Let me tell you about it's beginning... I'll start with a picture. Yes, that ugly crack is in the windshield of the BeanMobile. And how, you may ask, did it get there. 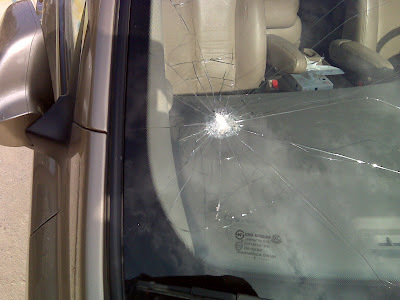 Well, I was heading to the airport to pick up El 3atal when suddenly a rock flies over a garden wall intentionally slamming into my car windshield. And before you even think it, yes that was some rock alright. It was between the size of a baseball and a softball. I immediately slammed on the brakes and called Teta Bean (since it occurred near their house and I was certain that my limited Arabic was not up to this situation). As I was looking around to figure out who did it, a stick comes out of the same garden and bounces off a taxi. A little kid pops his head out and ducks back in. A very nice girl (and this is why I do like Jordan) stops to see if she can help and then a man also stops by on his way in the building. The little boy swears he didn't throw the rock, his friend did. Where's his friend? He ran inside to hide. Well, El 3atal's brother shows up and tries every buzzer on the house to get the owners to come out. They studiously ignore all of them. Then he goes in and pounds on the glass enclosure in front of the door. Finally, they realize he's not going away and the entire family comes out, except the boy who apparently tossed the rock. The dad is indignant that it has nothing to do with him. Berates the child who was playing with his son for talking to us and sends him off with threats of a beating. Then he turns his rage on 3ammoBean. What do you want he shouts? 3ammoBean explains that the man needs to handle this. He demands that we simply file it on our insurance because it has nothing to do with him. His son is inside asleep. You know, here's what really makes me sure this guy's kid did it. He wasn't sorry that someone in his yard threw a stone, he wasn't apologetic that this very frightening experience occurred, he was simply pissed off that we stopped and expected him to step up and take responsibility. Well, today we'll say goodbye to dear 3ammoBean and I wanted to say goodbye here on my blog as well. 3ammoBean was a light in my life from the moment that the most amazing Bean family welcomed me in. He always had nice things to say and every time I greeted him until he could no longer speak, he welcomed me by saying "Hi beautiful." And, you know what? Even when I didn't feel so beautiful, if he said it, it reminded me that I am. In honor of 3ammoBean, please enjoy this amazing song by an amazing singer. 3ammoBean did raise me up. Go with God ya 3ammoBean. We will miss you, but know that you are in a much better place now. No, this isn't like world peace and lofty ideals.. it's more pragmatic than that. I'm sharing my prayers and encouraging you to do the same. If you add yours as comments, I'll add them to my daily prayer list, I hope you'll do the same. Lord, please be with us his coming week. Place your healing hand over dear Kinzi and all of the Konouz. Give them the strength, the joy, and the support of having wonderful friends and loved ones. Please be with CousinBean and 3amtiBean as they deal with the loss of 3mmoBean. We all feel the loss already and will more in the days to come. Give them your peace and joy in the knowledge that he is with you. Be with MimiBean as she continues to deal with the challenges and grief of the loss of PoppaBean. Help her see your hand in all things, Lord. In fact, Lord, give us just a little world peace, a little of your strength, a smidgen of your joy. After all, what to you is a little to us will be far more than we can even comprehend. We know you are with us, please help us see your movement in our lives and your plan for us, Lord. Bold Audacity: Getting Something for Nothing and STILL You Complain? So, we went to meeting today at the KG introducing parents to the new school year. They did the usual talking about the school's values, what they strive to teach, and their philosophy. They also went through the upgrades and renovations they have made and are making. Finally, after some time going through all of this she opened up the floor for questions. About the third question was one I found pretty telling. But first, let me set the stage for the question. Your choices as a parent at this school are to a) use the bus, b) pick your kids up immediately after class, or c) have them stay in a room with all the other kids whose parents are picking them up late (the Waiting Room). We tried the waiting room for ONE day with ButterBean. She came home afterwards and crawled under a table refusing to come out... The next day we had her picked up by the ladies at the nursery the twins attended. But, that's not to say it's awful, she just hates crowds and noise. And the waiting room is a small long room FULL of kids. So, this year we tried the TwinBeans in the waiting room (not expecting a problem). JujuBean cried and refused to go back, JuniorBean had a great time. Now I pick up JujuBean immediately after class and leave JuniorBean to go to the Waiting Room (he thinks it's more fun than his classroom). The Waiting Room is a long narrow room with a small table, some shelves, a tv/VCR, crayons and paper, and such. It's bare and crowded. But, here's the kicker, it's free. That's right, we don't pay a penny. Given the fact that we pay nothing, when my girls decided it wasn't to their liking, I called it a day and made other arrangements. However, the third question of the day during the presentation was from a man who was complaining about the fact that the Waiting Room was crowded, old, and really not up to snuff. He went on and on about how it had a significant impact on the school's attractiveness. Now, mind you, the majority (by far) of the kids ride the bus, so how significant this impact is, I couldn't really say. But I do find it very funny that he was complaining about a free service he receives... in a public forum... at length. After the Director addressed his question, saying that she had begun looking at it this last week, he went on about how much of an issue it was. It was kind of funny. Now, no group of has a corner on this kind of behavior and I always find it just a bit funny. They say don't look a gift horse in the mouth. This guy not only looked him in the mouth, he reached down his throat, and then said his teeth were ugly and his breath stinks. He'd better hope that horse doesn't bite him :). And when those planes went down, I listened to little-thinking colleagues talk about "those Palestinians" who were rejoicing. I explained that "those Palestinians" were mourning one of their sons. You would be foolish to think that out of nearly 3000 people, a Palestinian wasn't killed. We heard from Teta and Jiddo Bean that Ramzi was in the building. We mourned from afar for Ramzi and his family, who we were sure must miss him terribly. So, this year, a timely reminder from Tim (I never even know the date anymore) made me want to do more than just remember my horror watching the towers fall. It made me want to do more than remember my relief that El 3atal's project in the WTC had ended in May and he wasn't there. So I stumbled upon Project 2,996 and felt that a tribute to Ramzi would be the right thing to do. He gave me the opportunity to gently rebuke Americans caught up in the post 9/11 emotionalism. He gave me the chance to humanize Palestinians at a time when so many I knew needed that. He has given me so much. He loved family, he loved to read, he loved to cook. But mostly, it seems to me, he loved his family. He took his sister's children to play sports, he cooked Thanksgiving turkeys, he treated friends like family. Ramzi was expecting delivery of a Harley Davidson in April or May 2002. Unfortunately, Ramzi would never receive his motorcycle. His life was cut short. 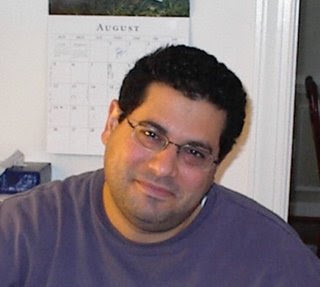 And, so this year, I ask each of you to observe a moment of silence for Ramzi today. At 9:11pm, turn off the TV, suspend your conversation, and reflect on our fallen brother. In this fish bowl that is Amman, let's give Ramzi a tribute on this anniversary of his death. Let's say we remember you. We won't forget you. We miss you. And it's equally true, whether we knew you or not. Visiting friends: The Eid celebration gives me the change to visit Muslim friends and spend time with them under no pressure. When it's Christmas or Easter, there's a sense of rush and urgency to fit everyone in. For Ramadan, I don't have to worry about obligation visits (not that I do too many of those) or being rushed. It's just another month for me, so I can take my time and visit with friends. Shorter school days: More time home with the Beans is always appreciated. Ramadan gives us the chance to spend time at home enjoying each other (but still have them out of the house for part of the day). Opportunity to talk about diversity: Ramadan is an excellent time to talk with the Beans about our faith and how the Muslim faith differs. We are able to talk about similarities and differences between Ramadan and a time like Lent. The drive is underway and will last for the next week or so, depending on the donations. The Action Committee is targeting the last 10 days of Ramadan for distribution. So tell a friend, tell a family member, tell the neighbor, tell the people at work, even the weird guy who sits in the corner of the office and who no one talks to; this could be your chance. Just like last time, when we went from this, to this. It’ll be interesting to see the extent to which blogs can make a social impact in Jordan. Those are the things I like best about Ramadan, what about you? Anything to add to the list? So my eye was caught by an intersting headline on msn and I found myself checking out an article about people dreaming of Sarah Palin. No, not wistful thinking or longing, actua, night time dreams. Here's the article ->http://www.slate.com/id/2199661/?GT1=38001. But the reason, I'm blogging it is a comment the author made that I find really off. He said, "Palin's supermom abilities provoke envy and anxiety in women, especially other working mothers." Supermom? Really is she a supermom? Hmm, I think I'd regular be a plain old vanilla mom then. I find it truly astonishing that unwed teenage pregnancy has gone from an embarrassment that demonstrates bad parenting (as spun by the Fox News pundits) with Hollywood celebrities to a poster situation for the anti-abortion people. How does that work exactly? And, do I need to have one of the Beans become pregnant out of wedlock, unable to support themselves, and living either on my dime or the government's to be a "supermom"? Is that REALLY what America thinks? You know, I'm all for family values, but teenage pregnancy is not one my family's values. If I were Sarah Palin (shoot even just being plain old MommaBean) I'd chafe very uncomfortably under the label "supermom". How does one live up to that? I guess I'd consider MemeBean more of a SuperMom than Sarah Palin. After all, she raised 2 children alone (and not by her choice). She lived on a government salary and managed to keep us clothed, fed, and housed. Her son also went into the military and served his country. Her daughter even managed to make it to adulthood before become a Mom. So, here we go, I'm electing MemeBean as the Uber-Supermom... Take THAT, Sarah Palin (teehee)! Reflections on Conventions, Naming not Political or What's in a Name? It's always interesting watching the trends in children's names in the US. Each year the lists come out and new names pop up. Some of those names are nice, simple, solid names and some are way-out there. Well, in Jordan, it seems that names must also go through cycles and new names get introduced commonly. (At least boy's names should be cyclical due to the first born named after Jiddo situation.) I was thinking about this today because of the kids and their peers in school. One thing I find interesting in the US is that the top 10 names remain fairly constant for boys and vary widely for girls. Boys' names haven't changed that much since 1900, girls names have changed greatly. Here in Jordan, I don't necessarily have insight into what are "normal" names and what are odd names. But, I do have some insight into common names these days, which I find interesting. So, here are some common names from the rosters of the under 7 set. Farah: ButterBean has two in her class alone. Last year, she had 3 Farah's in her class (you'd think they'd split them across the classes, no?). Clearly this is a popular name. I don't think, however, that it's a new name. Jude: Also two of these in ButterBean's class. One was referred to as the "English" Jude. (She was Arab as were both of her parents, but she didn't speak any more Arabic on starting KG than ButterBean. Her parents spoke to her only in English, sadly she had mediocre English skills and mediocre Arabic skills.) We also have friends with a daughter named Jude. I understand this isn't really a new name, but is new in popularity. Everytime I hear it, I think of the Beatles. Wonder if those who name their kids Jude do as well? Yasmeen: Another one that isn't new but is rather popular. I've yet to meet an adult named Yasmeen, but there are 2 girls in ButterBean's grade named Yasmeen. Have anything to do with Disney's Aladdin (teehee)? Zeid: When friends of ours had their first (12 years ago now), El 3atal said it was kind of an old name (you know like Gertrude and Cordelia). Now, throw a rock in pre-school and you'll hit a Zeid. Personally, I think it's a nice name. ButterBean's teacher was Marian. Yes, to the Arab eye, that is apparently equivalent to Marianne. However, an American would take a quick read of the name and pronounce it "Mary-un." Same with a girl at the bank, Suzan. I'm sure she thinks her name is Suzanne, but in English, it's "Suze-un." Leya: ButterBean had one of these in her class. I thought it was like Princess Leia in Star Wars. Apparently, it's Leah. You know, Lee-uh like in the Bible. So after complaining yesterday about traffic during Ramadan, today someone bumped into me on the way bringing the beans home from school. Fortunately, it was merely a fender bender. But the guy seemed perplexed that I insisted on getting his name and number and details. The traffic was stop and go and he decided to change lanes because the other one was moving faster. The cars in the lane in front of me stopped. I stopped as well. Unfortunately, the guy behind was paying more attention to the lane next to us than me. As a result he scraped along my back side panel. So, again, I wish each of you the ability to stay in your home from sun up to sun up during this Ramadan. We're taking our lives (and cars) into our hands when we venture out. Would that I didn't have to! I've been thinking about this post for a long time (well, since Ramadan started), but have avoided posting it for two reasons. Reason One: Laziness (notice the capital L). Reason Two: Fear of being perceived as insensitive (of course I AM American and we do typically lack the cultural sensitivity gene, so... maybe I'll get the American pass on that one). But, since 7aki Fadi and Bakkouz both posted about Ramadan and failed to mention my biggest pet peeve, I'm going for it! I mean, I know you're hungry (well, at least some of you are, for the rest what's YOUR excuse), but really. And, I have to admit, it's not just driving. It's also parking. You know, the "I'm-in-a-hurry-to-go-eat-so-I'll-park-in-front-of-your-garage-like-a-noodlehead" attitude. Not sure what I mean? Here, let me show you (yes I took a picture, although this guy wasn't the worst offender, just the one I had a camera available for). Mind you, I had nearly hit this guy before I could see him in my rear view mirror. The car is TINY and the guy is silly. Giving credit where it's due, when El 3atal left him a nice little note asking him not to block the garage, he moved his car and hasn't blocked it again (thank you!). The next day, I come home to find a new VW Jetta completely blocking the garage. And, I was loaded down with countless bags of groceries and needing to run quickly to get ButterBean at school. Needless to say, he's lucky he wasn't there when I got back. 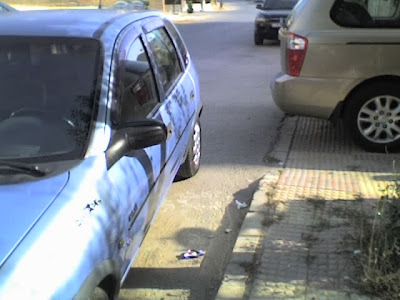 I'd not only have taken a picture of his car but gone to all the neighboring buildings to find out where he was (mental picture of small blond woman screeching like a fish wife in broken Arabic coming through now)! And then, the other afternoon, I was in the 6th circle when one of those circle crashers (you know who rush the circle with no right away and then get pissed when you honk) decided to stop short in front of me because I honked to remind him that he was about to hit me. If I had hit him, I'm afraid I would have had to use every woman's secret weapon (you gentlemen know what I'm talking about, that one true vulnerability that every man suffers (even Superman I think, forget Cryptonite, just give him a knee to the groin)). So, fortunately I didn't hit him, but a girl can dream, no? So, all in all, while Ramadan may be a blessed month for some, it is NOT a blessed traffic month. So, since you wanted to know, there's MommaBean's biggest Ramadan pet peeve. Here's wishing you no need to leave the house. Alright, honestly I watched 32 minutes of the 44 minute speech. By that point, I was just SO tired of it. Now, admittedly, my mind was made up LONG before this. There was no way I was going to vote for McCain, so his running mate is immaterial to me. But, I was interested to see how she measures up to the two previous women with a chance to end up/around in the White House (you remember Ferraro and Hilary). And, I am, after all, a woman who is committed to advancing women. So, I watched and saw what I have come to expect from the Republican party. 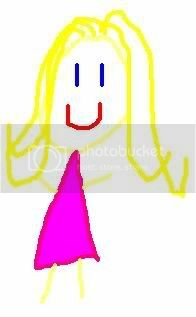 On the plus side, she's attractive (I understand she is a former Miss Wasilla, so you know... guess she would be nice looking). She's well-spoken and presentable. She has softer visual edges than both Ferraro and Clinton. Sadly, those are the only pluses I personally see. The minuses are, unfortunately, more numerous. When I see a speech like this one (a home run according to the conservative pundits), it reminds me of a scene from Men in Black. When they bring in all the military guys from the various forces and Will Smith and they give them the "test". Of course, Will Smith is a maverick and the only one who passes the test. The head of the Agency says something like you epitomize what we've come to expect as the best that the military has to offer. By his tone of voice, it's clear that he doesn't mean this as a compliment. This speech and Palin's delivery represent the best of what the Republicans have to offer, and I assure you that isn't a compliment. Palin started her speech with chatter about her fine and fabulous family. The rehearsed feel of the speech and the camera shots of her little girl holding her baby (awwwwww.... (please)) had the same sort of slimy feel to me of David Vitter's campaign commercials using his infant daughter's stay in the NICU as a play on his "family values" when he ran for a seat in Congress in Louisiana. And, it appears his definition of family values is as clean, clear, and universal as hers (for those who don't know, his name and number appeared in the phone book of the DC Madam and rumors surfaced of a relationship he had with a New Orleans call girl). Similarly, Palin's family values are apparently comfortable with pregnancy out of wedlock. Well, as long as we're consistent... And, the shots of the son who is about to go to Iraq (we'll hope she's still staunchly in support of the war after her son has been there a few months and starts complaining to Mom about the fact that the trucks have no armor and his buddies are being blown up right and left...). But, the real downside of this entire speech is what I think has plagued the Republicans for years and years and years. They are long on criticism of their opponents and short on vision. They are long on rhetoric about "victory" in war (as if either side EVER wins, and I'd like to see them really consider how much of a victory the Iraqis feel they've accomplished) and short on interest in improving the country. They are clearly very comfortable making very personal decisions for other people, which is my biggest voting determination. I typically vote Democrat, quite frankly, because there is no party for me. I want a party that is fiscally conservative (which given the track record of the last 3 Republican Presidents, they can no longer claim to be) and socially out of my business. While I personally don't support abortion, I also am not arrogant enough to think I have the right to make that decision for others. Being against something is different than legislating it. My Home Is In (Fat Free) Alabama? My home state is in the news today and what a thing to be known for! Yes, that's right, only in Alabama will they chare you for being fat! The State (the largest employer as I recall) has decided to charge people for their free health insurance if their Body Mass Index (BMI) is too high. BMI measures your height to your weight and determines if you are overweight. It doesn't directly measure body fat but it "correlates". Anyone else think this is a little off? After all, we all know that 2 people can weigh the same amount and yet one be husky and the other really thin. Bone size has alot to do with how much you weigh and there's no BMI for small, medium, and large bones... Color me concerned about the precendent this one sets. Even the CDC has this to say "BMI is used as a screening tool to identify possible weight problems for adults. However, BMI is not a diagnostic tool. For example, a person may have a high BMI. However, to determine if excess weight is a health risk, a healthcare provider would need to perform further assessments. These assessments might include skinfold thickness measurements, evaluations of diet, physical activity, family history, and other appropriate health screenings." Okay, so the CDC says BMI isn't a diagnostic tool, but the State of Alabama thinks it should be the trigger for charging people? 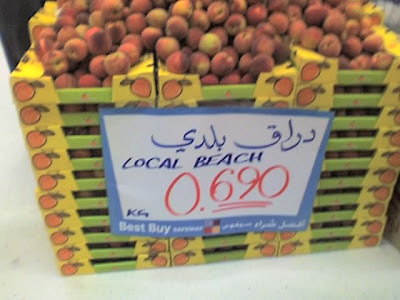 The Beauty of Amman's Local Beach! I couldn't help but capture a shot of this one. Ladies and gentlemen, I give you... Local Beach. And, don't you know the folks at local stores wonder about this crazy lady who is always taking pictures. I only wish it were a REAL beach, you know the kind with sand, sun, and WATER. At the kids soccer game today, we were joking about the fact that we went to the beach, only it was missing the water. A most important element in this heat. May the cool days come quickly! So, given our ties to the Southeaster Louisiana area, I've been watching the Hurricane Gustav news with bated breath. Some of you may remember, we moved here roughly 6 months after Katrina. We had been living in Baton Rouge, a town roughly an hour away from New Orleans. In Baton Rouge, we fared well having only to deal with extended power outages (ours was out only 4 days), astonishing amounts of traffic, overcrowded schools, and constant low-flying helicopters and airplanes accessing the Red Cross staging area next to our house. Baton Rouge is away from the coast and, although it suffers from water challenges (too much, rather the opposite of where we live now), remains fairly consistently unflooded. We still have many beloved friends in Louisiana and I was quite concerned watching Gustav barrel on towards the region. After all, surely New Orleans doesn't need more heartache. So, I've been watching the Internet avidly, checking in with MimiBean to see if she's heard or seen anything on the US national news and such. Today, it seems clear that Gustav came ashore with less wind and in a better location than Katrina. Thank You, Lord. And, so I begin to reflect on the interesting nature of living in hurricane prone New Orleans and thinking about all that anyone who views the issue from a distance misses. After Katrina, everyone was so pleased to share their thoughts on what could have been done better. Clearly, everyone should have been evacuated before the storm. Really, the city government should have gotten everyone out of there. And, there is some truth to the idea that no one took Katrina as seriously as they should have (and I do mean NO one). But, Gustav provides a nice example of what truly typically happens in New Orleans (and has for many, many, many years). Big, nasty looking storms rage and head for New Orleans, then they turn aside, slow down, and otherwise become much less threatening. And, in the comfort of homes far from the coast after Katrina, people said yes but everyone should have left. I'd estimate while we lived in Louisiana, we typically saw 2 storms per SEASON that caused voluntary evacuations because they were headed towards New Orleans. Can you imagine the uproar over money that would be going on if this kind of widespread evacuation had happened twice every season for 20 years (40 years) without a Katrina? How many times do you think people would continue to rush out only to have a near miss? How many people would decide to just stay home and hope that this one will be no worse than the 30 others they've ridden out? And, do you blame them? You know how they say hindsight is always 20/20. Well, that's how I feel about Katrina. We were terribly fortunate. Baton Rouge is typically the place they evacuate to. We were in no particular danger and life went on, if a bit more crowded, as usual. And yet, I didn't blame people who stayed. I got caught in the evacuation 2 storms before Katrina trying to get one of the kids to the Doctor. A 10 minute drive took 30 minutes, and that's only because I knew all of the back roads. Front roads would have taken 3 hours. And that storm, like Gustav, dropped a little rain and then went along its way. It's enough to make anyone dismiss concerns until the time has come and gone to leave. So, for those of us who lived in the storm zone, how it was handled afterward was a much greater issue than the before. Because over the years there have been many, many might-be-bads and expecting everyone to leave is unrealistic. This first big near-miss after Katrina everyone left (2 million people, that's really an evacuation folks). But, come a few more years down the line with 3 or 4 more storms that head for the Big Easy and then veer off and people will again grow complacent. They will again assume, oh this one will turn too. I'm thankful to see that Gustav landed in a place with less population, although my heart goes out to those who lived along the coast. In this storm, too, we will see people who have lost everything. To those in Port Fouchon and surrounding areas, I pray that your homes and lives are intact and you will able to move on as before. Although I sit half a world away, I still think of the beauty of Louisiana (and miss the water!) and keep you in my thoughts and prayers during Hurricane Season.